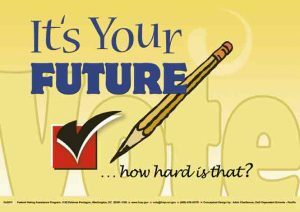 Wilmington – National Voter Registration Day is Tuesday, September 26, 2017. This nationwide event raises awareness of voting and civic engagement. It also stresses the importance of registering eligible but unregistered citizens to vote in upcoming elections. The Department is not participating in any special events. Citizens, however, may register or update their registrations at any of the Department’s offices between 8 a.m. and 4:30 p.m. during normal workdays and online using the State’s voter portal 24 hours every day. “Delaware’s Department of Elections strongly supports this nationwide event. The First State is a national leader in making voter registration easy, convenient, and accessible. The eSignature program, implemented in partnership with the Delaware Division of Motor Vehicles (DMV), is a model automatic registration process. It fully integrates the registration process into DMV customer transactions,” said State Election Commissioner Elaine Manlove. “Additionally, Delaware has online voter registration via a full-service voter information portal. A Delaware citizen can use the ivote portal to register to vote, update their registration information, and much more, at any time and at their convenience,” added Manlove. Delaware joined ERIC (Electronic Registration Information Center) to improve the quality of its voter registration records. Founded by The Pew Charitable Trusts to improve the accuracy of America’s voter rolls, ERIC is now a non-profit multi-state consortium run its members. ERIC gives Delaware the tools necessary to increase the accuracy of its voter rolls. It also gives the Department information for reaching out to Delawareans who are eligible but not registered. Other changes to the voter registration process lets the Department completely process most applications the same day that the Department receives them. Besides the daily flow of applications from DMV, the Department also receives applications online, by email and mail. This daily workflow ranges from moderate to heavy. The over-all volume this past fiscal year was moderately heavy. Specifically, the Department of Elections offices registered 38,083 new voters and processed 143,094 updates or corrections to voter records between July 1, 2016 and June 30, 2017. Need more information? Visit the Department’s websites for additional election and voter registration information – State Election Commissioner, Kent County Office, New Castle County Office, Sussex County Office.